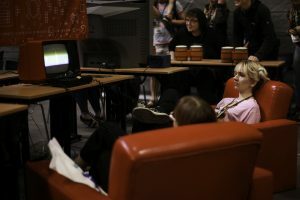 Strona główna » Blog » Program » All you RetroFanatics come hither – The Retro Zone will be part of the Video Games Section once more! Pyrkon is the time of premieres and launches. New board games, books or comics appear, you also get to play new RPGs. Some, however, prefer the feeling of nostalgia and want to savor the titles they know and love. These are the Pyrkon-goers we are having the Retro Zone in the Video Games Section for once again. Travel in time with Pyrkon! Dreaming of going back it time to the times when you were young, or even when you were not there yet? Humanity has, unfortunately, not found a way to travel in time yet. The Retro Zone organized by Dawne Komputery i Gry is the closest thing that will get you there. It takes up as much as 250 square meters of space in the Video Games Section and in it you can find everything a lover of classic games can dream of. Historic equipment like Amiga 500 or Atari 65XE, old periodicals on games and computers – it’s simply a vintage-style paradise for computer fanatics! The fiercest ones can also reminisce about their moments of triumph they had in internet cafes or during IT classes! Contra, Deluxe Ski Jumping, Worms Armageddon or Upside Down Mario tournaments all happen there and there is a wide range of games to choose from! All this for the price of the Pyrkon pass. So if you can’t afford a DeLorean and a bit of plutonium, you just can’t miss it!